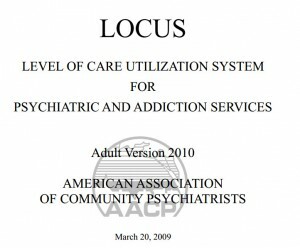 LOCUS© and CALOCUS© instruments were developed by the American Association of Community Psychiatrists (AACP). They are clinical tools that evaluate and determine level of care placements for psychiatric and addiction services for both adult and child/adolescent populations. We use these tools when we are working with the patient or family who is seriously symptomatic, failing to improve despite aggressive outpatient treatment, or otherwise at risk. There are the only level of care is that were developed by expert clinicians and not by managed-care companies trying to reduce inpatient hospital utilization. An older man we saw a couple of months ago illustrates the value of these tools. Get a complicated set of problems including history of alcohol use, bipolar disorder, and recent trauma. He also was having significant suicidal ideation and difficulty controlling his temper. We engaged in in the process of assessment and treatment planning but we didn’t seem to be getting anywhere. He had a hard time remembering what was going on and after a couple of sessions it seemed he was getting worse and we were not getting closer to our goal of developing an appropriate treatment plan. 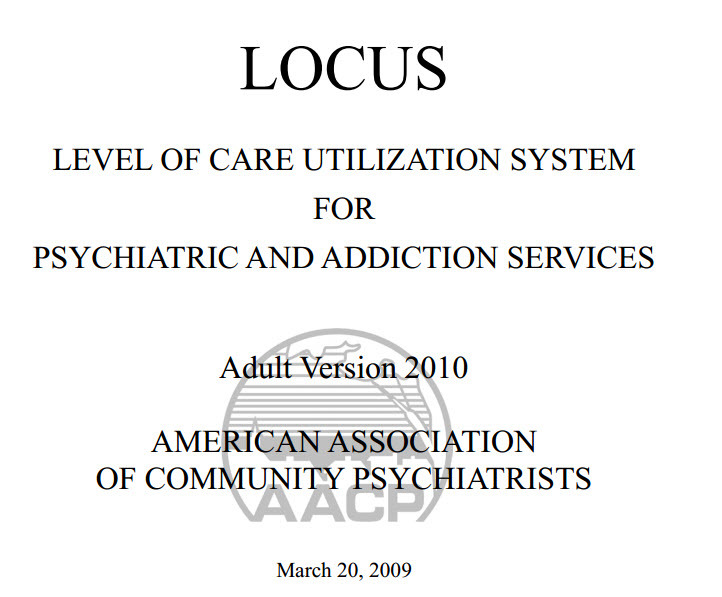 We used the LOCUS tool to assess risk factors, the complexity of his problems, the severity of his symptoms, his history of treatment response, and other factors and it came up with a recommendation for residential treatment. In retrospect it was clear that we were trying to do something on an outpatient basis that really, because of the severity and complexity of the symptoms, could only be managed in a residential setting. The evaluation was done collaboratively and we jointly agreed on the appropriate ratings and this later foundation or talking with him about the reason for making a recommendation for a higher level of care that made the discussion seem less abrupt and perhaps capricious. If you’re a clinician you can purchase access to this tool using this link: LOCUS ONLINE. And for everyone this detailed summary explains the rationale for the tool and its various categories: AACP LOCUS 2010.